The Amber Ghost Japanese Maple is a stunning small tree with ever-changing foliage colors. The deeply-divided leaves begin in spring as the palest of near-white pink. In summer they are a soft amber-pink, accented by the pronounced green veins. In fall the tree ignites into colors of orange, red and yellow, bringing the garden alive with color. This tree grows steadily to about 15 feet tall, and as much across, making a perfect smaller tree for a shady garden. It is of course perfect for Asian-style gardens, but it fits beautifully into a woodland garden, a modern, minimalist garden, or indeed into any garden at all. It is hardy to zone 5, and it grows best in partially or fully shaded areas in the shade of buildings or large deciduous trees. Plant your Amber Ghost Japanese Maple in a lightly shaded spot, on the north or east of a building, or under deciduous trees. It needs some afternoon shade to preserve its leaf coloring, and all-day light shade is best in hotter zones. Water frequently when young, and do not allow the roots of mature trees to dry completely. This tree has no pests or diseases, and it is easy to grow if located correctly and watered as needed. Many people think Japanese maples are ‘difficult’, but with a little basic care they are easy to grow and trouble-free. This one is a treasure in any garden, that will only grow in beauty as the years pass. 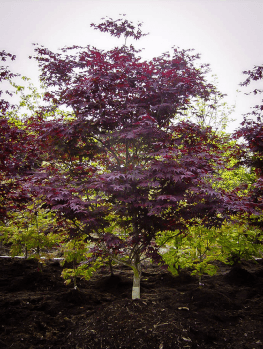 Japanese maples come in a wide range of sizes, forms, and leaf colors. 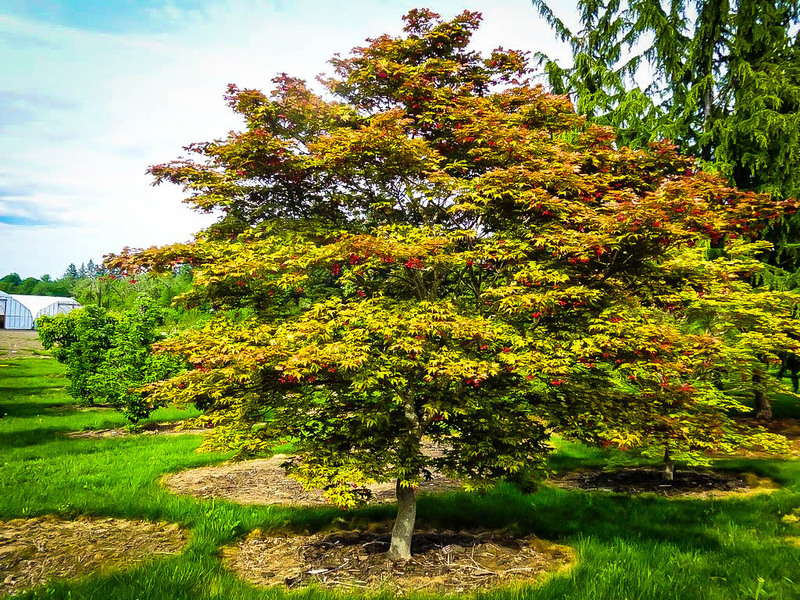 If you are looking for a medium-sized broad tree, that passes through a whole kaleidoscope of leaf colors as the seasons pass, then this tree is a top pick. The Amber Ghost Japanese Maple begins the spring season with exquisite leaves that unfurl in a ghostly, almost-white color, suffused with pale pink. As they mature they pass through shades of pale melon, gradually transforming into a soft, pale, amber red. These colorings are especially striking in the evening, when your tree will glow just like a ghost in the fading light. When fall arrives the leaves become vibrant orange with red and yellow accents, glowing in the soft sunlight. Throughout all these changes, the color is accented by the pronounced green veins, which form a background network and highlight the coloring even more. Forget boring ‘always red’ Japanese Maples, and instead plant a tree that looks different almost every day. It will bring colors that are sometimes mellow and sometimes vibrant, adding interest and beauty to even the simplest garden. The Amber Ghost Japanese Maple is a steady grower, reaching 8 to 10 feet in about 10 years, with a spread of 6 to 8 feet. In time it should reach 15 feet tall, so consider this when choosing a planting spot. It will spread wider with age, and could be 15 feet wide too, in time. Just imagine how beautiful that will be in your garden. The leaves are deeply cut, almost to the base, into five broad lobes, spread out like the fingers of a hand. Down the center of each lobe is a prominent green vein, spreading out into a fine network of thinner and thinner veins, that accent the soft and elegant coloring of the leaves. The trunk and stems are green, turning to smooth gray as they mature. No pruning is required for this plant to become a multi-stemmed small tree, with graceful, spreading branches. Grow the Amber Ghost Japanese Maple in partial shade, especially from noon onwards. In cooler areas some morning sun is beneficial in developing the best colors. In warmer areas the light, dappled shade beneath tall trees all day is the ideal location, although some sun for the first couple of hours of the day is still beneficial. Water at least once a week when young, and do not allow even mature trees to become completely dry. 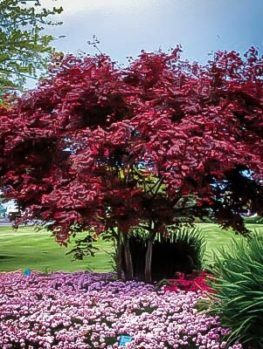 Japanese Maples grow best in moist but well-drained soil, with plenty of added organic material. Mulch over the entire root zone in spring with rich organic material, to conserve moisture and provide a steady but gently supply of nutrients. Keep the mulch a few inches from the trunk. With its broader leaves, this tree is not so prone to the summer scorching that can damage forms with very finely-divided leaves. The Japanese Maple (Acer palmatum) is a small tree found growing under larger trees in the forests of Japan, Korea and eastern Russia. Unique specimens have been collected for centuries, and a whole culture has developed around these remarkable trees. Collectors, enthusiasts and breeders love creating new trees, and Talon Buchholz is a world authority and breeder of these trees. 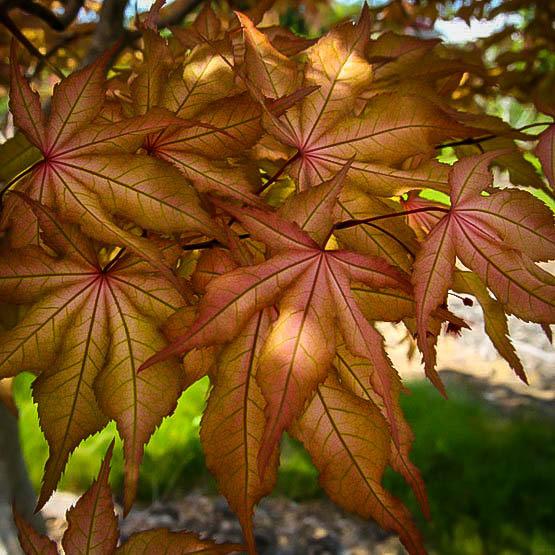 Buchholz started the Flora Wonder Arboretum to collect Japanese Maples and other trees in 1981. To pay for his passion he started Buchholz & Buchholz Nursery to supply retail nurseries with rare and unusual Japanese Maples and other rare trees. Some years ago he started breeding ‘reticulate’ maples. These are forms with pronounced green veins in the leaves, and their skeleton look inspired him to call these his ‘Ghost’ series. 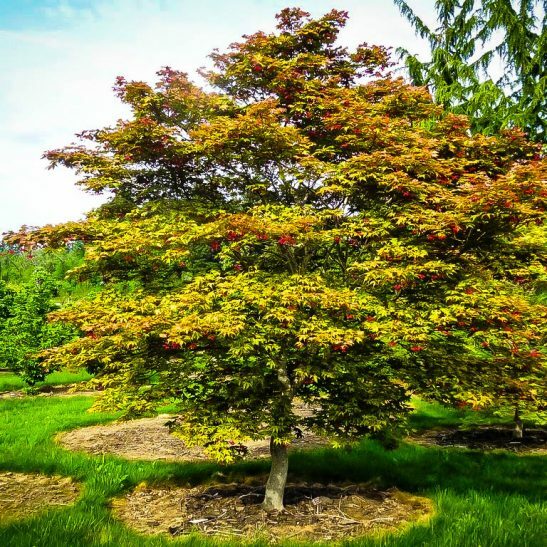 Talon Buchholz has bred numerous Ghost maples, but everyone agrees that ‘Amber Ghost’ is probably his most spectacular, as well as being an ideal size for a specimen tree. Our trees are produced by grafting stem pieces taken from correctly identified and healthy specimens of this tree onto the roots of seedling Japanese maples. Cheaper seedling trees, or ‘unnamed’ trees, cannot even begin to compare, so always choose the best. We have a very limited supply of this fabulous specimen, so order now, because the Japanese maple enthusiasts who come to us frequently will quickly take them all.